Need A Saniflo Engineer Brighton, Eastbourne or Worthing? The saniflo system is used for toilets & bathrooms where a gravity drain cannot be used. The saniflo unit is a pumped macerator unit that pumps kitchen, toilet or bathroom waste to a gravity drain via small bore pipe-work (pipes less than 2 inches in diameter). Saniflo systems tend to block if excess waste is flushed into them such as expensive toilet paper, sanitary towels, dental floss, plastic bags etc. These items can prevent the pump from working in the Saniflo and cause blockages and flooding. DrainBoss Plumbing & Drainage have Saniflo engineers with the equipment to deal with blockages in Saniflo systems. 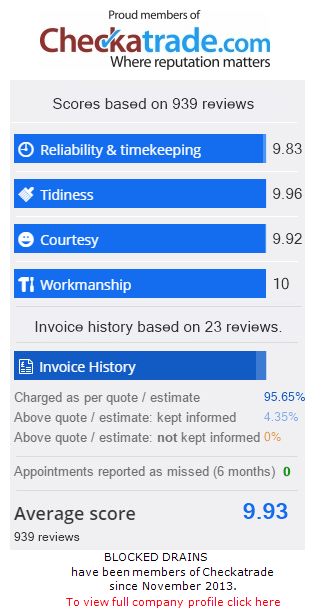 All work is guaranteed and we don’t charge a call out fee. Saniflo pipe-work can be unblocked with electro mechanical drain unblockers. Blockages on the pipe-work are frequently caused by 90 degree bends on the outlet pipes, we would recommend installing 45 degree bends where possible. This will also help with clearing future blockages. we have Saniflo engineers in Brighton, Hove, Burgess Hill, Crawley, Crowborough, Eastbourne, East Grinstead, Haywards Heath, Horsham, Lewes, Littlehampton, London, Portsmouth, Reigate, Redhill, Sevenoaks, Tonbridge, Tunbridge Wells, Worthing and all towns in between. Generally this means the capacitor is blown because it is overloaded often because the motor is blocked by a foreign object or it is worn out and cannot turn, if the motor has failed your Saniflo will need to be replaced but can be repaired if it is blocked by a foreign object. Get the Saniflo inspected as soon as possible. The Saniflo Box is Hot. This is caused by a blocked motor or a blown capacitor. You should switch the Saniflo off as soon as possible to prevent any further damage and call DrainBoss to inspect the unit ASAP. My Electrics Keep Tripping or Fusing. This normally occurs when a motor is worn and water gets into it or the Saniflo has loose wiring. You should get DrainBoss to inspect as soon as possible. Water Backing Up to Shower or Bath. Often caused by a blocked Saniflo, or an external waste pipe blockage or a worn or blocked motor which won’t pump out the waste. DrainBoss can repair this issue. A blockage in the waste pipe will cause the Saniflo to not switch off until the unit is empty. It is also possible the switch and the membrane could be defective and need changing. Switch the machine off from the mains and call a Saniflo engineer. This could be due to a defective membrane which can be replaced. Normally caused by failure of the switch or membrane has failed.This can be fixed with new parts. The Sanvite needs cleaning. Call DrainBoss to thoroughly clean your Sanvite 3. This could be due to the power being switched off accidentally, the air button could be faulty, the air switches inside the unit could be faulty or the PCB board inside the unit is damaged, This is repairable and normally caused from acidentally turning off the switch, the motor may have worn out and is not repairable. The lid on the inlet pipe has shrunk, this is often caused by too many toilet cleaning chemicals. It is also possible that the saniflo box is full of waste and there is not enough room for water, the box will need to be cleaned out by hand. The waste pipe from the Saniflo is too small. A minimum 33mm waste pipe is needed. It could also be the switch and membrane that are not working properly. Or call a location number closest to you.